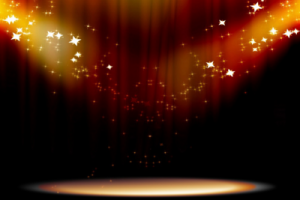 How do you find a stage magic trick? 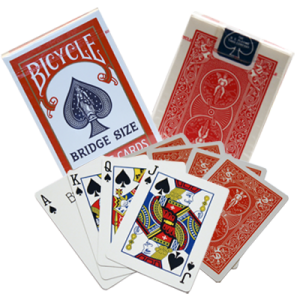 When you are searching for magic tricks, do you click your way through the online magic store catalogues? Are you on magic shop mailing lists and when you get an email in your inbox saying new magic tricks have been released you get really excited? Ken and I were just the same. But then something happened to us. What in the world could possibly stop us getting excited about new magic tricks? Simply, we started to realise that so many new tricks are just old tricks dressed up with a new name and some new packaging. We also started to realise that we were spending money to re-purchase something we already owned that we weren’t using because we thought it was old and tired. We both opened our eyes and realised there is GOLD IN OLD. The closer we looked into this the more we found. Magicians from decades past didn’t get standing ovations from their audience because the magic was ‘bad’. It was, and still is, good magic. This stage magic trick is old and it is GOLD. I know so because I use this in my shows that earn me money. Few people have seen this because we have moved on to a time when newspapers are getting fewer and fewer. 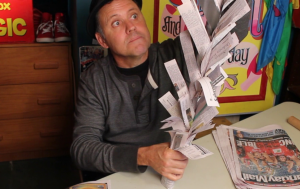 This means there is a real surprise element added to my magic show. It is not a magic trick (in the strictest sense of the word). It does however work perfectly with magic tricks because it adds variety. It is certainly my experience that audiences love variety in shows. – The biggest tip I can give you on making this is to use a brand new box cutter blade. Ask your parents to help you out. – This makes it fast and easy. Try and devise your own way to make these cuts. Please tell me if you work out a better way. I love to find smarter ways to do things. – Newspaper is perfect for this magic production. It is much thinner and lighter than regular paper you would find in your printer for example. I have found I can roll up to about 40 sheets to make a tree that grows to nearly three metres in height. You can’t go too much higher than this because the weight of paper and even a slight breeze will cause the tree to fold in the middle and unceremoniously fall to one side. And believe me it doesn’t look that great when this bends and flops to one side. Bad magic. Your audience will love it if it just goes 3 feet into the air. An impressive stage magic trick for sure. Another tip: when you extend it to about two thirds of its length it is better to shake the last third to the floor so it touches the ground. This is an applause cue with your hands out to the side and it really shows the height compared to your own height. Did you enjoy this Stage Magic Trick? To learn more easy magic tricks Click here!